Intel announced the Xeon Phi ("Knights Corner") a few months ago and bought the Qlogic infiniband team and Cray fabric team to bolster its HPC efforts. 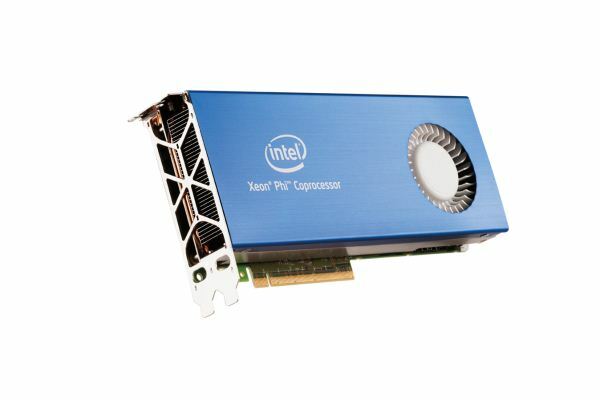 A clear signal that Intel will not stand idly while GPU vendors try to conquer the HPC market. Dell, Intel and the Texas Advanced Computing Center (TACC) build the first Supercomputer based upon the Xeon Phi, called Stampede. Stampede can spit out 10 Petaflops. If it was released right now, it would occupy the third place in the top 500 list of supercomputers. Stampede will go live on January the 7th, 2013. Anyway, the Xeon Phi is definitly not limited to ultra expensive supercomputers. Supermicro showed us the Superserver 2027GR-TRF which contain 4 Xeon Phi cards thanks to two redundant 1800W (Platinum) PSUs. The rest of the server consists of two Xeon E5 and 16 DIMM slots in total, supporting up to 256 GB. So it seems that one Xeon Phi card consume about 300W. At my workplace we have a fairly well developed MPI/OpenMP environment. We've dabbled with a Tesla card, but we would like to avoid re-writing everything in OpenCL. Even then, we don't know how long nVidia will support OpenCL. "So it seems that the Xeon Phi cards consume about 300W." "For comparison, a quadcore Haswell at 4 GHz will deliver about one fourth of that in 2013." Do you have more info about the 2Ghz frequency ? I also to think 16 double precision flops per core per cycle or 4 double precision flops per thread per clock * 1 gigahertz. I am surprised to learn that there are only 8 double precision flops per core per clock or 2 double precision flops per thread per clock. I'd agree. Peak rates are usually quoted using FMA. Johan De Gelas, thank you very much for your article. Aren't some of the 64 cores disabled? Previously it was reported that there would be between 51 and 64 CPU cores per Xeon Phi SoC. [2 Gigahertz]*[512 flops/clock] = 1.024 double precision teraflops. Actual performance is always below theoretical performance. You would need quite a bit more than 2 Gigahertz to hit 1 teraflop double precision. 2 Gigahertz is confirmed? Pretty amazing for a 64 core SoC. How many single precision flops per core per clock?